For those of you who have followed my historical blog, ArkieGamer, you may not believe this, but I actually finished all of the miniatures that I had ordered, BEFORE placing an order for more minis. Or at least before they arrived. 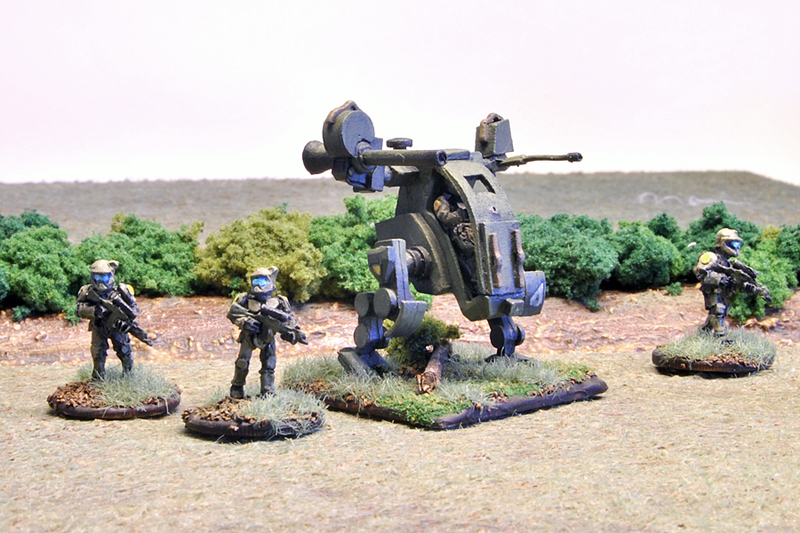 Without further ado, here are my Khurasan Federals. 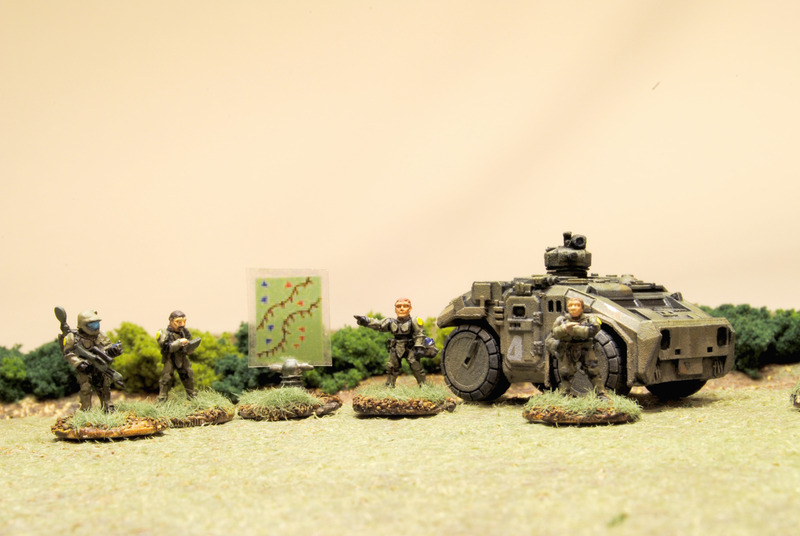 A typical squad, accompanied by a Polecat armored car. I’ll probably use these guys as a recon element, of some sort. Probably the least useful unit I bought, as far as getting it on the table. 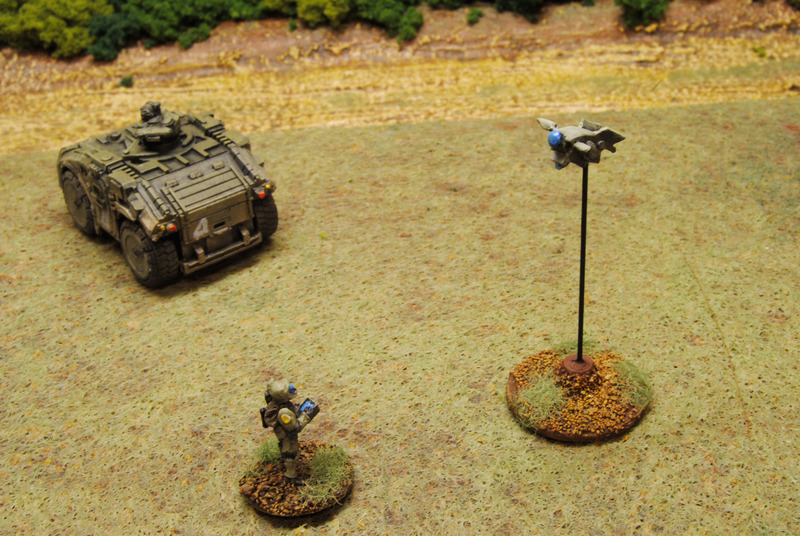 On-board artillery, even at a small scale like 15mm, doesn’t make much sense for close-in skirmish. I love this little scout drone. I thought about basing him with acrylic rod, but decided that black is best. Probably the least useful unit I bought, as far as getting it on the table. On-board artillery, even at this level, doesn’t make much sense for close-in skirmish. I tend to get obsessed about things and do extensive amounts of web research until I begin to grasp the zeitgeist of whatever said thing might happen to be. I’m sure I’m not the only one. 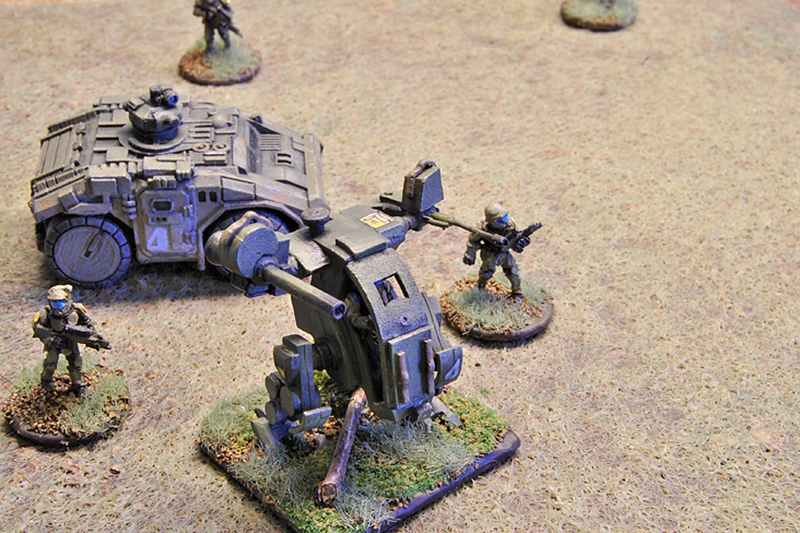 Before I begin to digress too badly about being an obsessive nerd, I’ll just say that one of the models that particularly struck my fancy when I was relentlessly searching for information on 15mm sci-fi wargaming was Khurasan Miniature’s Polecat. The Polecat is basically a futuristic HMMWV with the sort of functionalist industrial aesthetic that James Cameron (or Ridley Scott, for that matter) captured in Aliens. I really love it. In fact, it’s the model that pushed me over the edge into beginning to collect, paint, and hopefully game 15mm science fiction. Like the Humvee, the Polecat is ubiquitous. They can even be found at battalion HQ. Here’s my version. 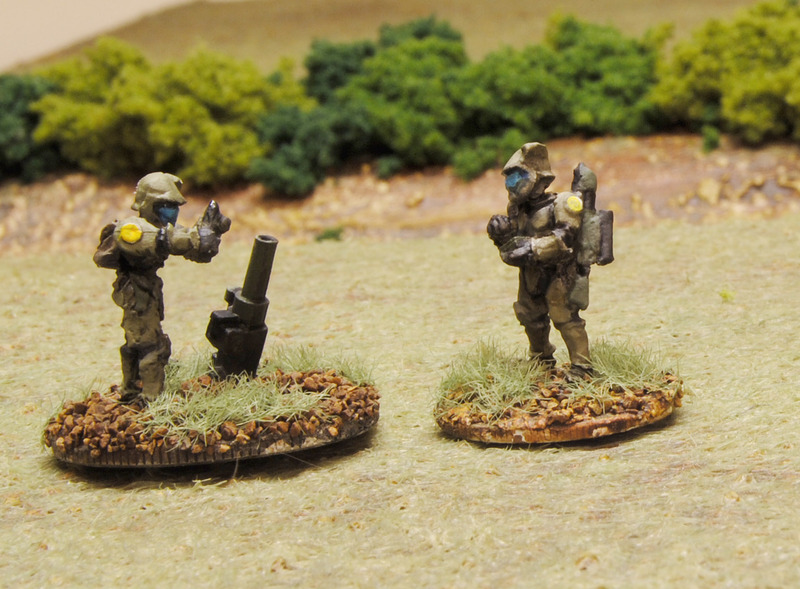 I used a similar palette to my infantry, with Vallejo Russian uniform being the primary ingredient. 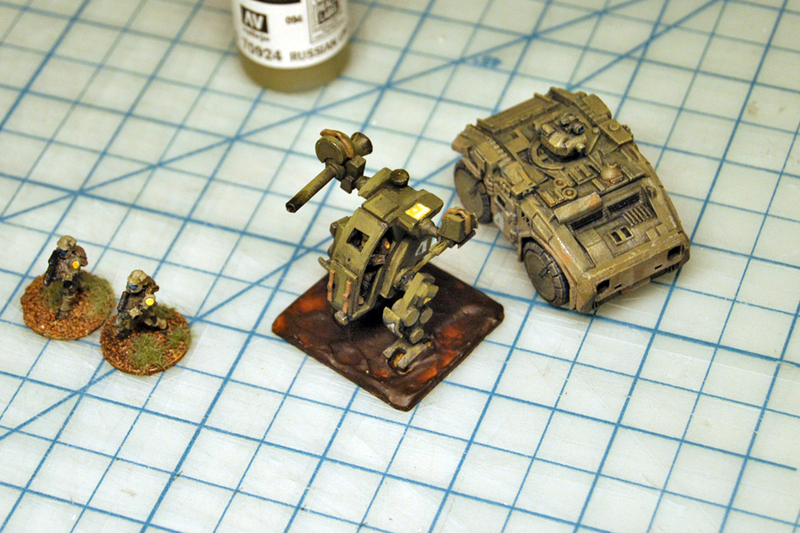 I went a little overboard on the weathering, and will probably try to tone it down a notch for my next 15mm armored vehicle. The “4” is supposed to resemble the Vilani font from good old Traveller, but it was quite difficult to execute at this scale! If When I do another of these, it will have to have been nicknamed and tagged as ‘Pepe’ by its crew. The Polecat is ubiquitous, like the Humvee. They can even be found at battalion HQ. 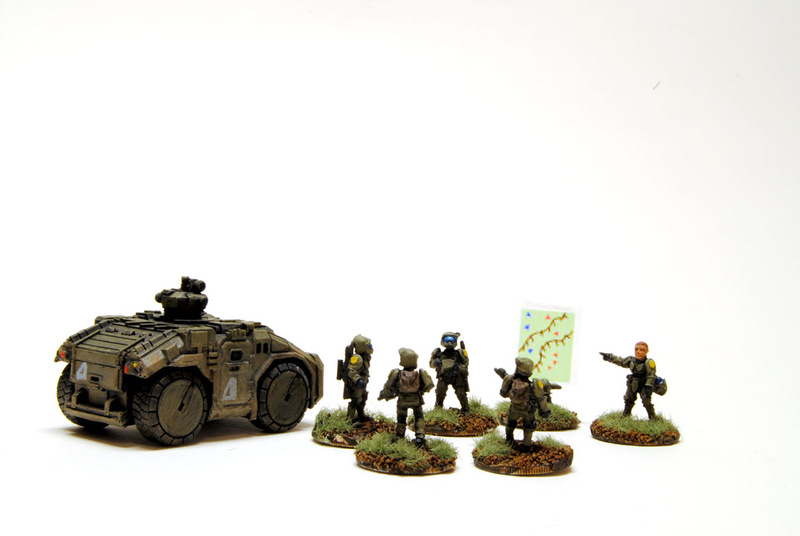 The Polecat carries four, according to Khurasan’s website fluff. I guess the last guy is manning the turret on overwatch. I really muffed the Vilani style “4” here. The bottom bar should be much thinner. The tail lights look much better at table distance than they do in this photo. They’re just vermilion, some sort of GW bright yellow, and a medium blue with Future Wax varnished over. 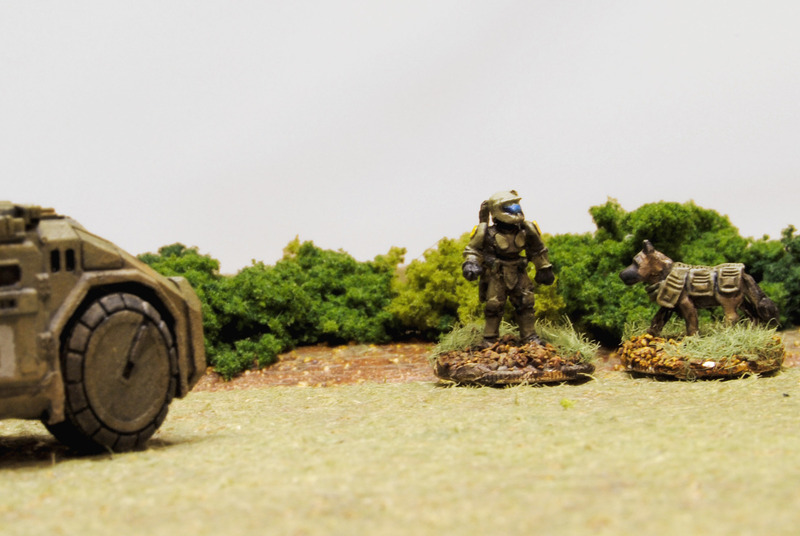 I’ve painted my first 15mm Sci Fi figures, as personal first for the scale and the genre. These are Khurasan Miniatures Federal troops. 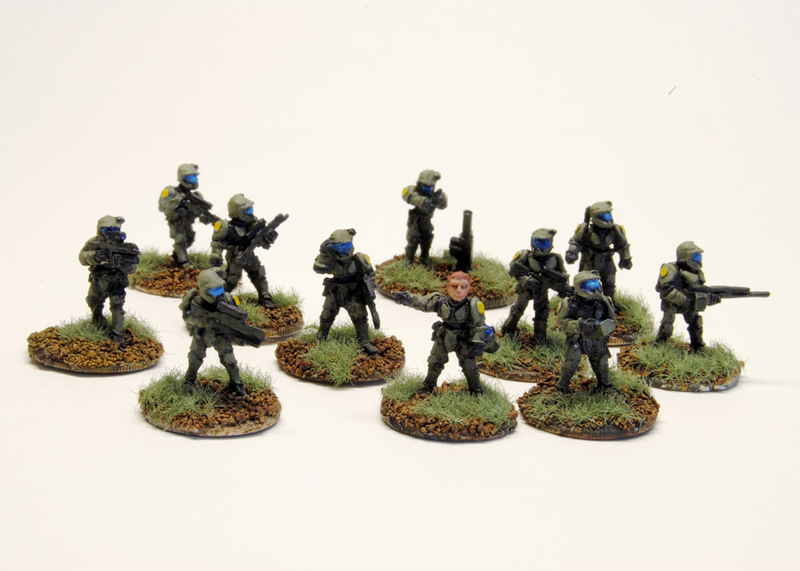 I have another 9 figures to paint, which will give me one squad, a command group, and a couple of heavy weapon attachments. 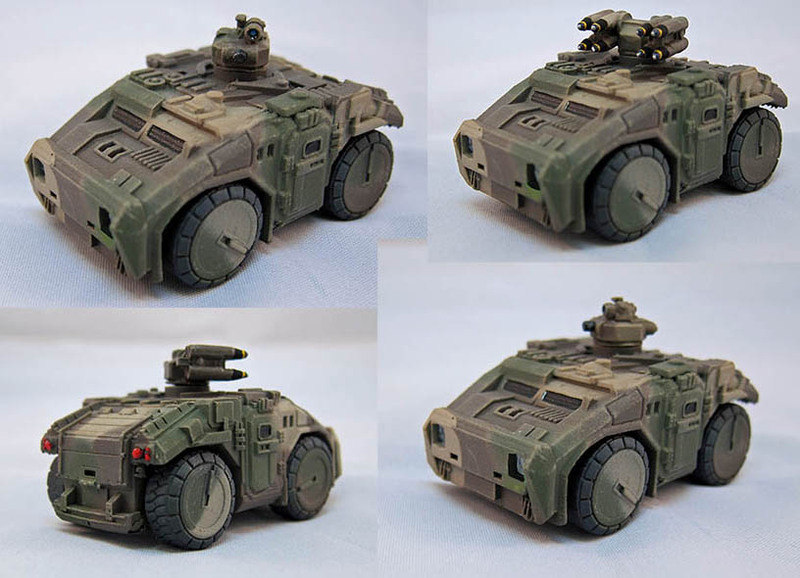 I’ve promised myself I won’t be ordering any new figures until I have the current batch finished, but the ultimate goal is to build up a platoon and a couple of light armor vehicles. Obviously I have a long way to go, but 15mm is a blast to paint.Laying down the base colors in 15mm is very quick, and this allows you spend more time on the fun stuff. Primary colors on these guys are Vallejo Russian Uniform. The hardware is Russian Uniform mixed with German Camo Dark Green. I started out with white primer and did a couple of black washes along the way. I think my paint is way too thick, and I’d really like to get the armor looking like some sort of satiny composite plastic rather than the painted gypsum board that it now resembles. They’re based on US dimes. I’m in the process of deciding whether or not to color code the bases for unit type/number. 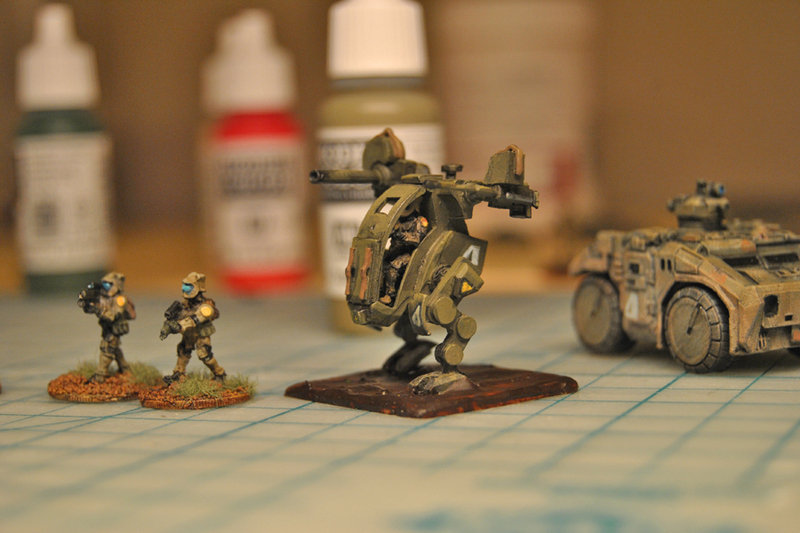 Obviously I have a long way to go, but 15mm is a blast to paint. 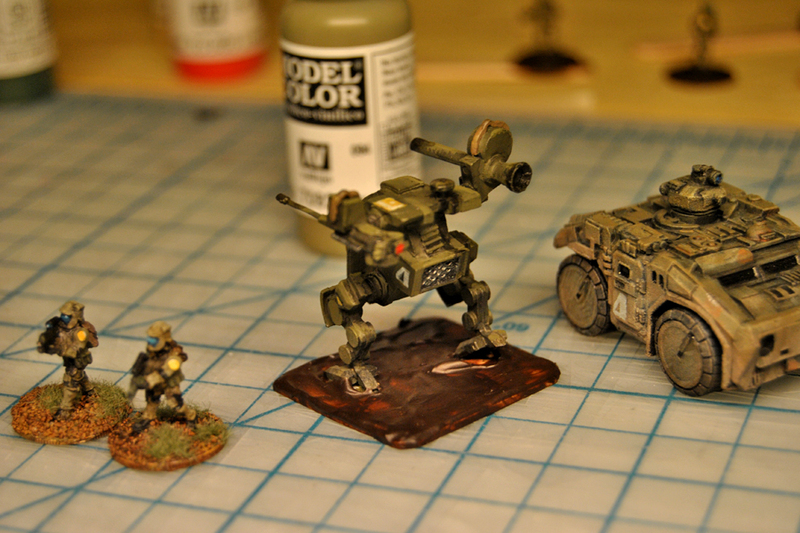 It’s quick to lay down the basic colors in 15mm, which lets you spend more time on the fun stuff. From left to right: Trooper with grenade launcher, trooper with SAW, and what is probably a point man giving a hand signal.